Someone once said that the Philippines is the only tropical country in the world that celebrates the summer season and if you see the frenzy of activities and photos posted on the different social media, you will understand how true this is. The most popular destination during these hot and humid summer months are the beaches. 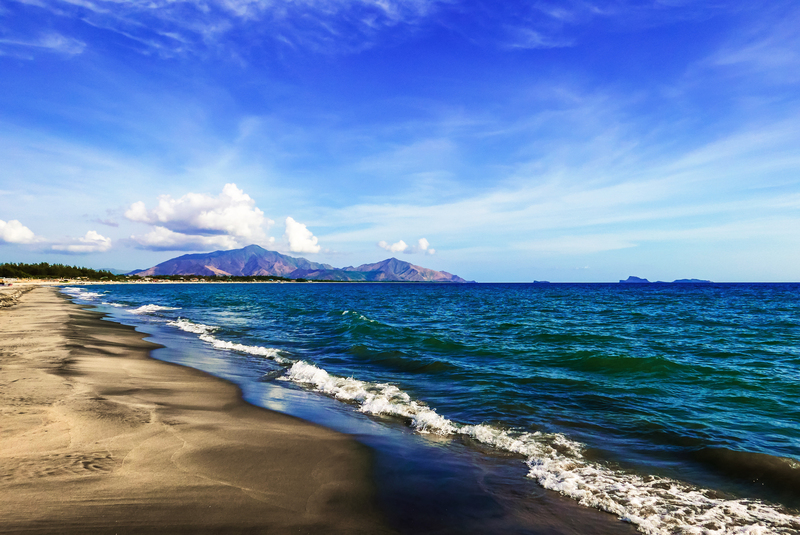 The Philippines, being an archipelago, is blessed with so many beautiful world-class beaches. Almost every year or every other year, my in-laws would plan and go on a summer vacation with the whole clan. As far as I can remember, each of these vacation trips would see us travel to different beach resorts in the country. We usually travel to the south-based locations like Batangas or Palawan. But this year was the first time the whole clan travelled north to Zambales. 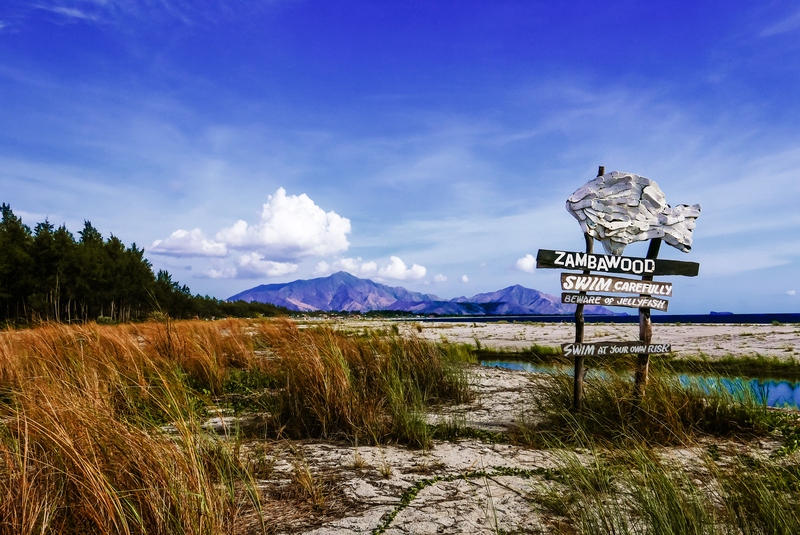 Zambales is a province of the Philippines located in the Central Luzon region in the island of Luzon. 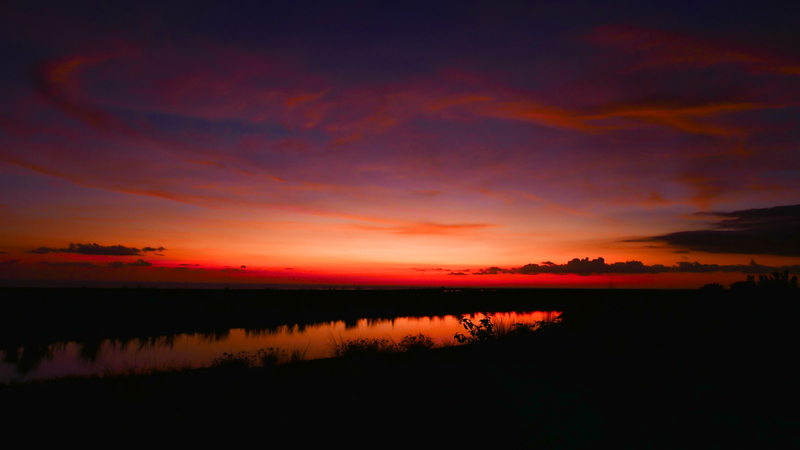 It lies on the western shores of Luzon, along the South China Sea. Its shoreline is ragged and features many coves and inlets. It has two well-known destinations – Mt. Pinatubo, a once dormant volcano that violently erupted on 1991, and Subic Bay, which was the location of the former U.S. Naval base. 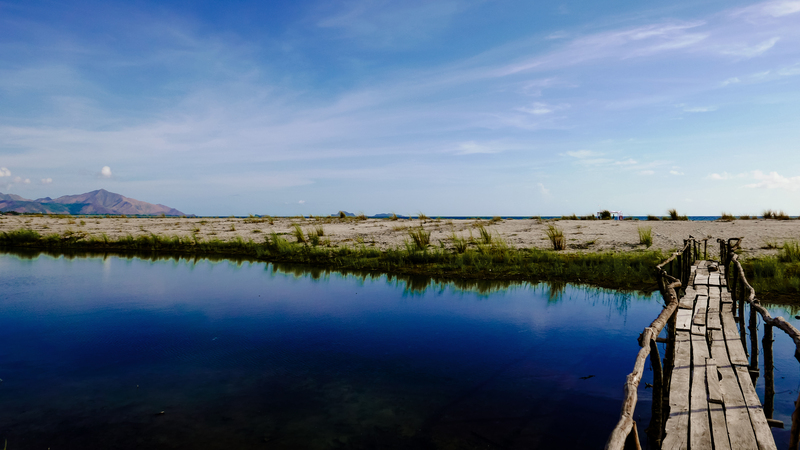 Subic Bay forms a natural harbor and is located along the southern end of the province. The former naval based had already been converted into a special free port zone (SBFZ) under the management of Subic Bay Metropolitan Authority (SBMA) where multinational companies set up their light industries there to take advantage of the tax and duty-free setup along with the existing infrastructure there. 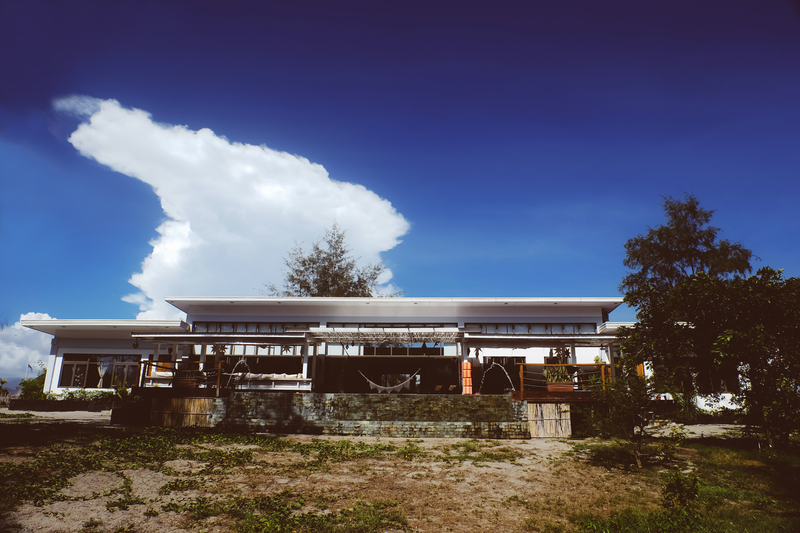 It’s now a largely commercial area with the Subic Yacht club, several resorts, theme parks and shopping centers located inside it. 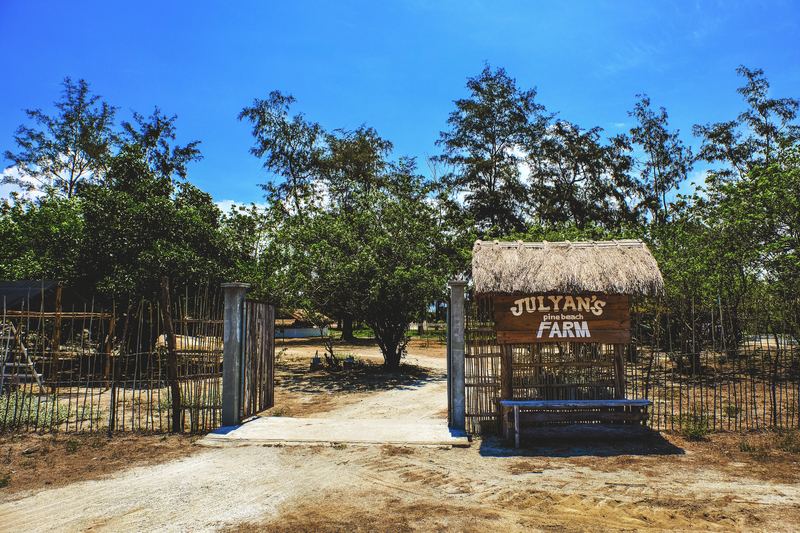 Because of these topographical features and proximity to Metro Manila, it has become one of the go-to destination for people who want to escape from Manila but want to go somewhere near along the North. Because of this many new resorts and hotels have been cropping up in the area. 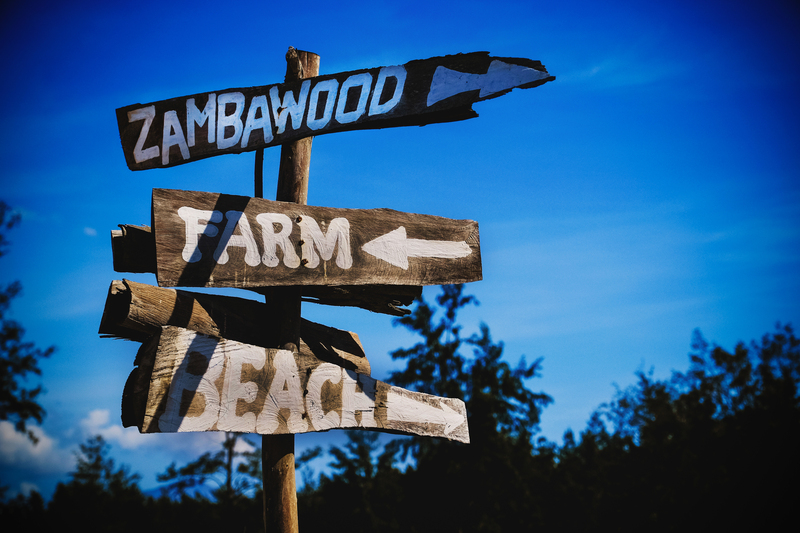 The resort we travelled to is called Zambawood (www.zambawood.com) and is located in San Narciso, Zambales. Travelling by car from Metro Manila to Zambawood takes approximately 2.5hrs to 3hrs via the NLEX-SCTEX route with which you traverse through SBFZ. Once you reach SBFZ, you are about 40mins to an hour’s drive from Zambawood. 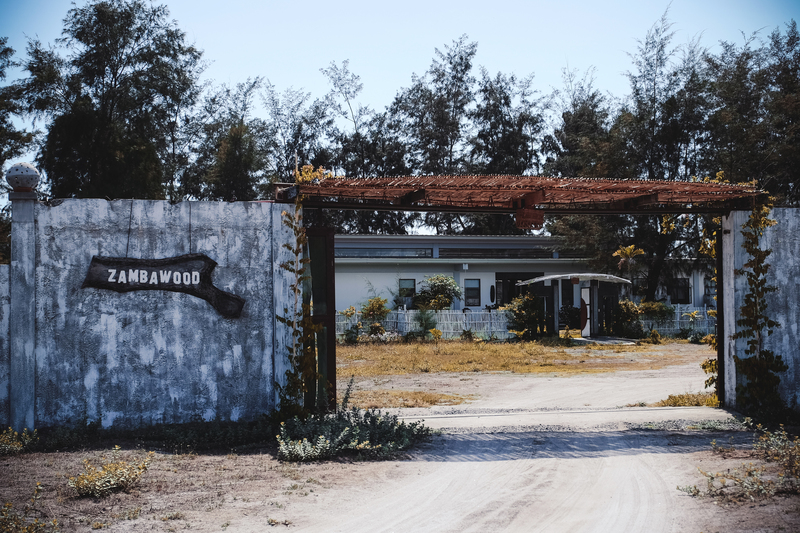 Zambawood is a luxury beach resort which started as a peaceful and tranquil enclave for Julyan, the owners’ special need adult son, to live, enjoy and find his purpose, is now converted into a private resort for others to enjoy. 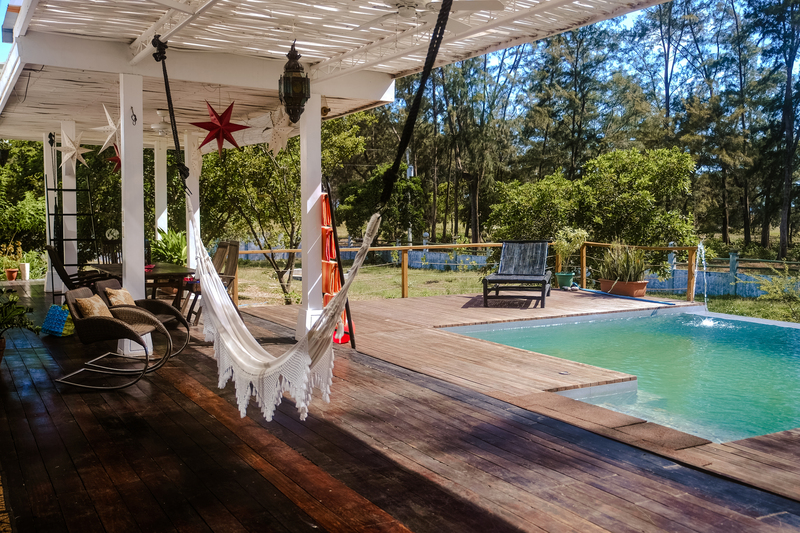 Included in the whole property is an organic farm, which is being tended by Julyan and the Beach House, which is being rented out to guests to discover and enjoy. Upon reaching the town of San Narciso, you have to travel a narrow dirt road that looks arid and dry. 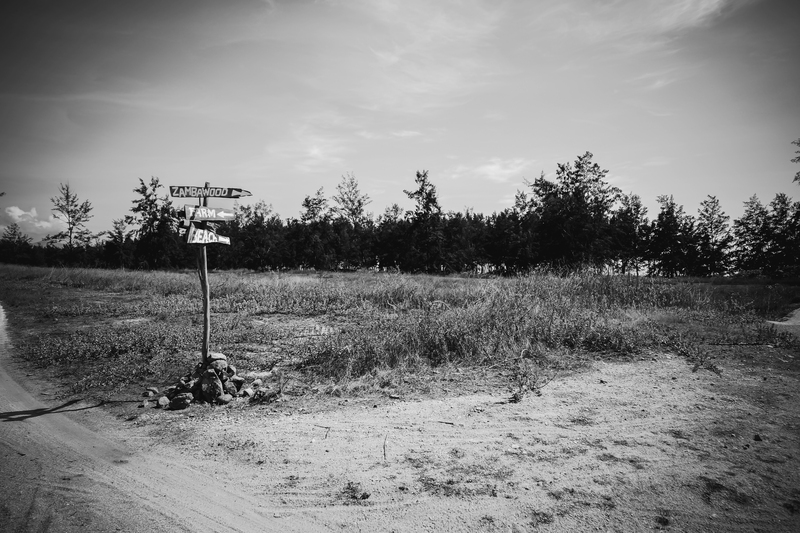 At that point, I was beginning to wonder if we had somehow made a wrong turn somewhere and was lost but, after a few more minutes on the dirt road, we reached a crossroad with a wooden post and signs on it.To the left of the road were the directions to the beach and the beach house while to the right was Julyan’s Farm. 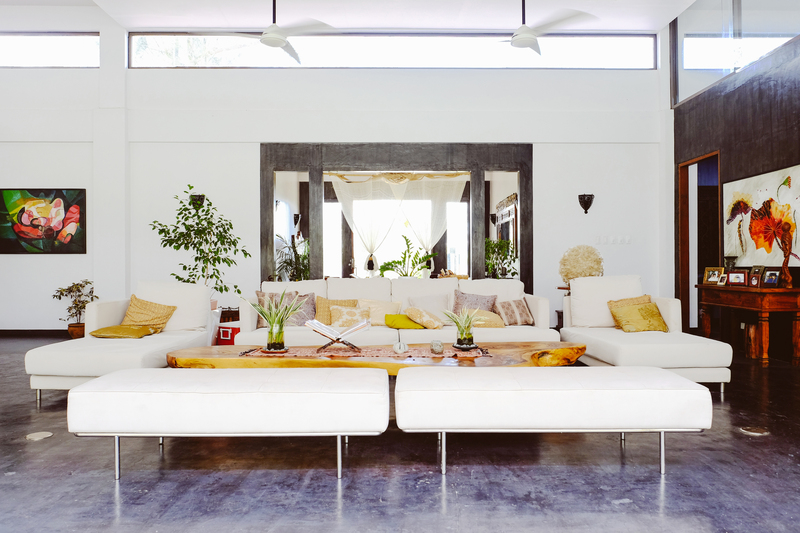 The Beach House is a wonderful single-story modern structure of cement and wood inside a fenced compound. The white exterior paint and the dark wood accent inside along with the black cement floor and tasteful décor made the place look so inviting and comfortable. 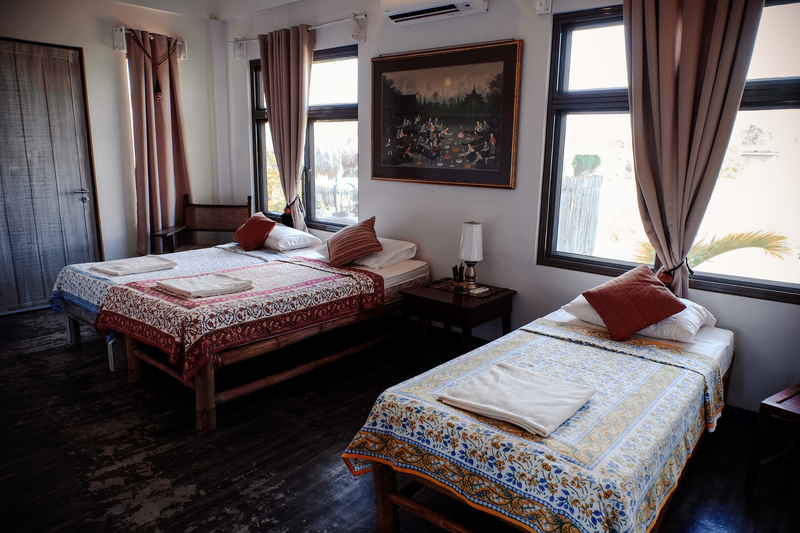 It has 4 air-conditioned bedrooms (2 of which are master bedrooms with private T&B), which can accommodate a maximum of 21 persons. 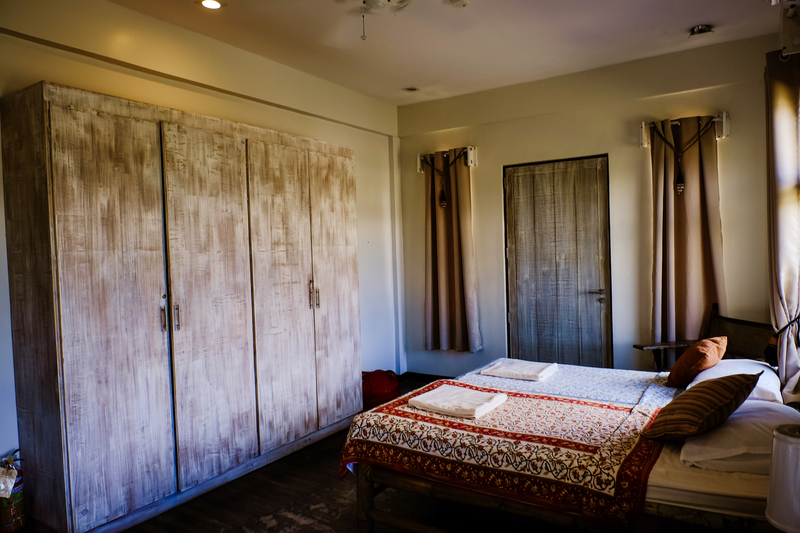 The room my wife & I was stayed in had a Mediterranean styling and was really quite comfy. Unfortunately, I wasn’t able to tour the other rooms. 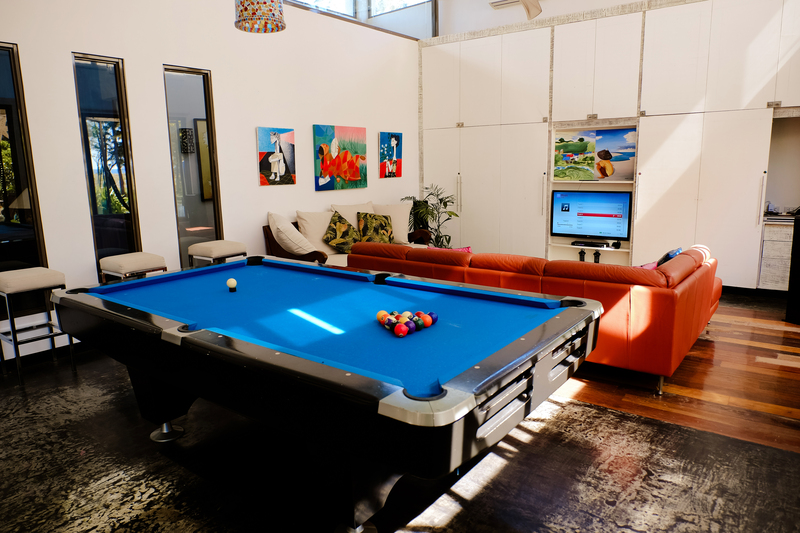 Aside from the bedrooms, there is also game room with a billiard table and a Hi-fi system with speakers hooked up in both the game room and outside common areas. There is also a flat screen HD TV with a Nintendo Wii gaming console and an Apple TV attached to it. 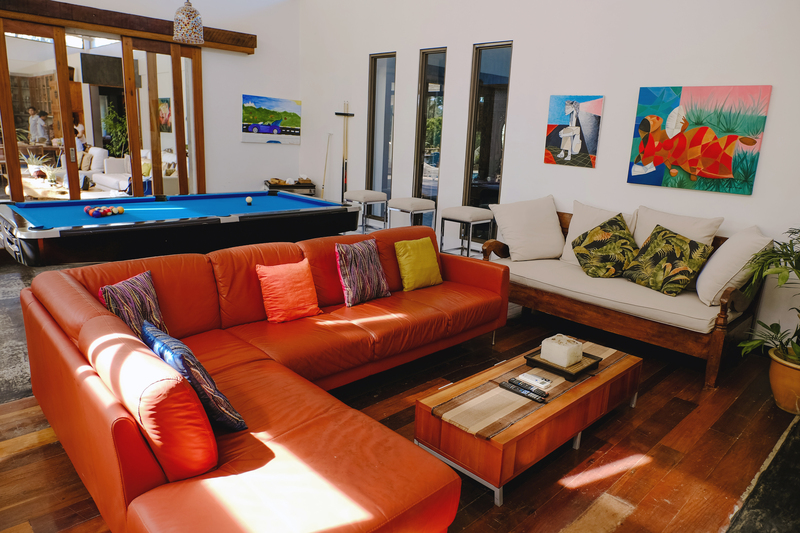 The living room has a large sofa with a huge recycled wood table and leads directly to the outdoor terrace with 2 hammocks, a swimming pool and outdoor dining area. 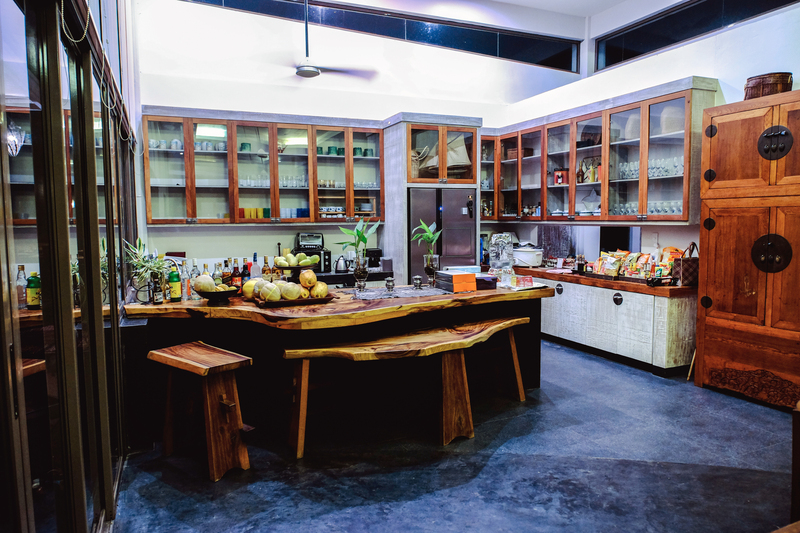 There is also a fully equipped kitchen where in you can cook your own food (you can bring your own food for cooking) paying only a nominal fee for its use or you can request the staff there to cook for you, again for a fee. Our vacation package arrangement with Zambawood included free breakfast for the duration of our stay. The pool was an infinity pool with a shallow section for small children. It overlooked the back garden, which was looking a bit unkempt during our stay there. Beside the pool was a shaded outdoor dining area where our group of 16 had all our meals. 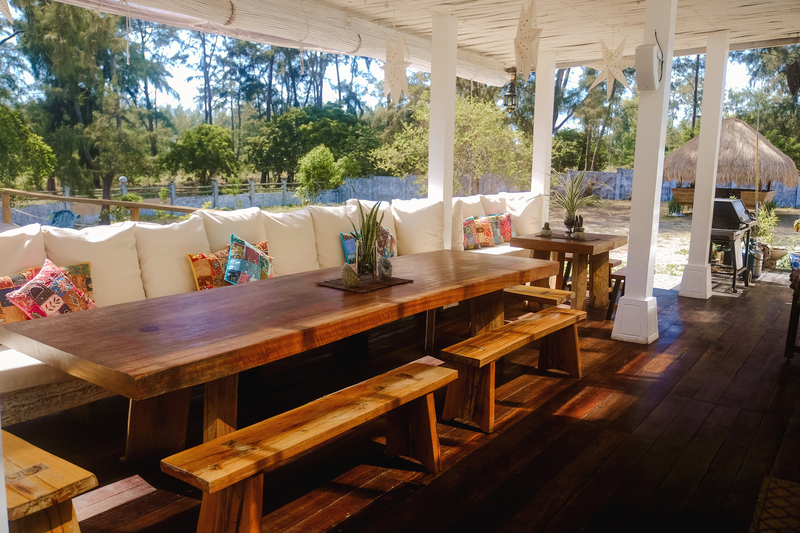 The Beach House had a group of attentive staff that was always ready to assists us. They provided us with beach towels for our swims and other staff we might need to make our stay pleasant and worry free. By the fence on the backyard garden is a gate that lead to the path going to the beach area. The beach is a 10-minute walk from the house. 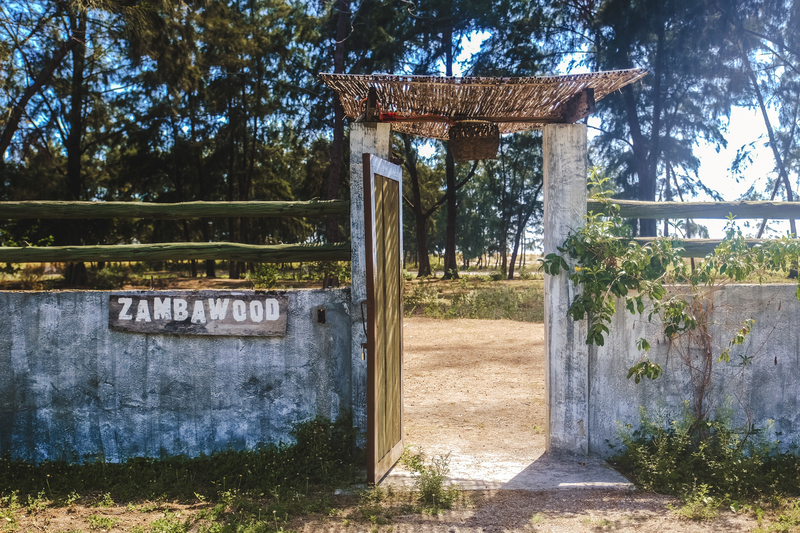 If you choose not to walk to the beach, Zambawood will provide a small open-backed pickup to take you there. 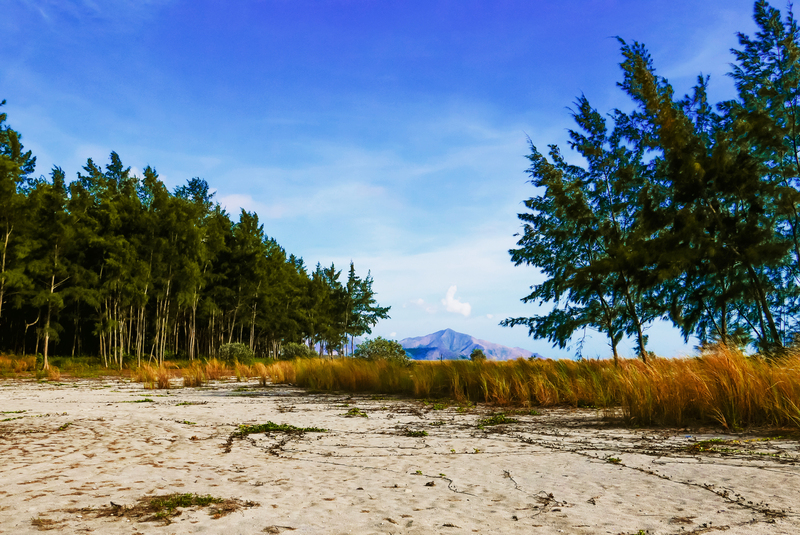 The winding path that leads to the beach is quite scenic with some shaded areas and views of mountains and trees. There was even a narrow wooden bridge over a natural lagoon on the way to the beach. 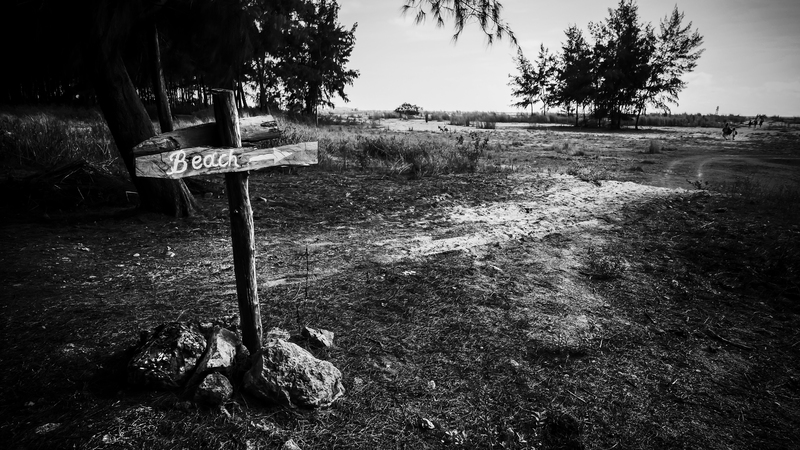 The beach itself was not spectacular but it was clean and private, as Zambawood has leased the rights to the beach so the guests can enjoy swimming and relaxing there without being disturbed. The sand is coarse and dark but not rocky, and the water was not very clear due to the constant moderate waves lapping by the shore. It was also devoid of fishes or any marine life near the shore (At least, none that I could see.). A couple of the staff accompanied us to the beach and stayed there the whole duration we were frolicking at the sea. They set up a shaded area with beach chairs, towels and plenty of cold drinking water for us. Towards the end of daylight during my 1st day there, I was blessed to have witnessed one of the most spectacular sunset I’ve ever witnessed. It’s as if God was showing off His Majesty to me. To say I was awestruck is an understatement. All photos taken by Daniel Y. Go. Should you wish to use the photos for whatever reasons please do send me a message at danielygo@gmail.com for my permission. Previous PostHeart of Worship Next PostWhat does it really mean to you?